The public long has become accustomed to guide dogs for those with visual impairments, first used in 1929. But when the use of dogs for other types of help — such as alerting people with hearing impairments to sounds, pulling wheelchairs and helping with mobility issues — became common after enactment of the 1990 Americans with Disabilities Act, controversy over access came with it. The controversy intensified as other species entered the service-animal ring, and as “emotional-support animals,” those designated to help someone suffering from some form of psychiatric disability, have become common. Courts and human-rights commissions from East Coast to West Coast have dealt with access complaints pertaining to a service iguana, ferrets, a duck, goats and miniature horses, to name a few. The Americans with Disabilities Act provides a guideline that leaves open a circus of interpretations. Here we highlight some of the most unusual types of service animals used to assist people with disabilities in a variety of ways. 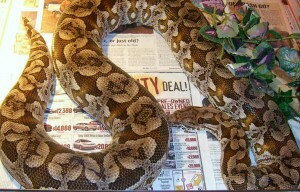 Daniel Greene says his almost 5-foot boa constrictor is a service snake. The reptile, who rides around town on Greene’s neck, helps alert the 46-year-old Washington man to impending seizures by squeezing him more tightly when he’s about to have one, Greene tells the Seattle Times. This gives him time to take his anti-seizure medication or look for a safer place to have a seizure, if he can’t prevent it. 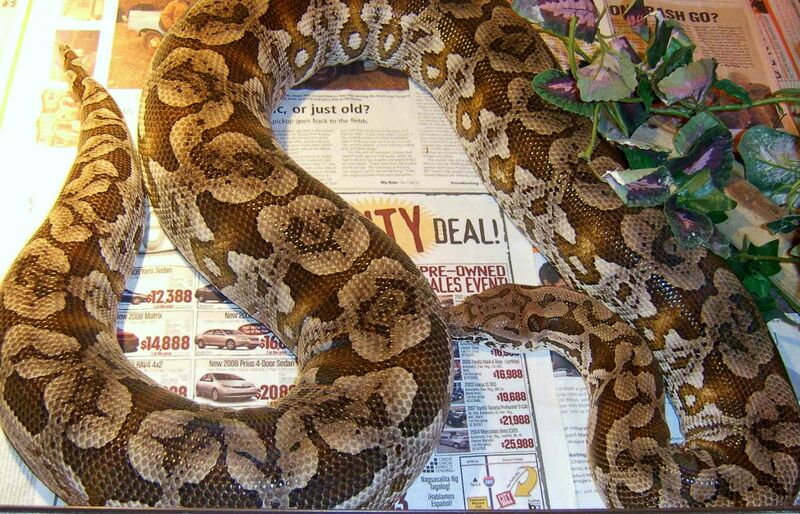 These snakes are also said to help patients with other disorders such as Bipolar Disorder, Obsessive Compulsive Disorder and Panic Disorder. 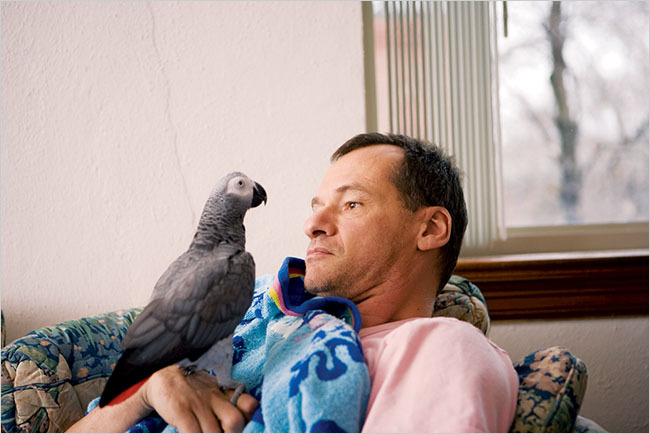 Jim Eggers, who suffers from Bipolar Disorder, accidentally discovered that his parrot can help him calm down and avoid destructive behavior. Sensing that her owner is on the verge of a psychotic episode, Sadie talks him down with, “It’s OK, Jim. Calm down, Jim. You’re all right, Jim. 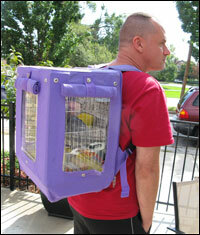 I’m here, Jim.” He carries her around at all times in a backpack carefully fitted to hold her cage. You’ve heard of seeing-eye dogs, right? How about a horse? Miniature horses are being used as guides for those with visual impairments, help animals for the mobility impaired, and therapy animals in nursing homes, hospitals, and children’s centers. 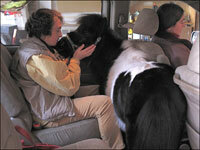 Ann Edie, who has a visual impairment uses a guide miniature horse named Panda. Edie isn’t the only person who uses a guide horse instead of a dog — there’s actually a Guide Horse Foundation that’s been around nearly a decade. The obvious question is, Why? In fact, Edie says, there are many reasons: miniature horses are mild-mannered, trainable and less threatening than large dogs. 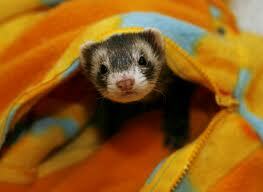 They’re naturally cautious and have exceptional vision, with eyes set far apart for nearly 360-degree range. Plus, they’re herd animals, so they instinctively synchronize their movements with others. But the biggest reason is age: miniature horses can live and work for more than 30 years. In that time, a person needing a service animal typically goes through five to seven guide dogs. That can be draining both emotionally and economically, because each one can cost up to $60,000 to breed, train and place in a home. 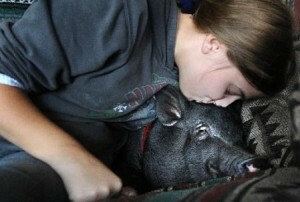 Pigs, pot-bellied pigs in particular, can be trained to perform many of the functions that an assistance dog would. They can perform tasks for their owners that the individual may have difficulty doing. Capuchin monkeys are trained to assist with grasping of items and performing manual tasks such as opening door, fetching items and the like. 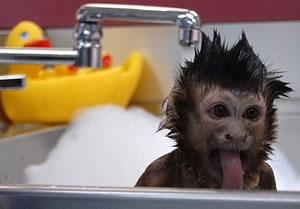 Read more about Capuchin Monkeys as service animals here. Service animals are an important part in the lives of many individuals and they serve as both assistants and companions. Guidelines as to what exactly is considered a service animal is very open to interpretation, therefore guidelines as far as access to public areas seems to become confusing. To read more about the ADA, service animals and access see here. Thanks for creating valuable article concerning the subject. I’m a fan of your web site. Keep up the exceptional job. Hate to say this but the DOJ changes are wrong and need only to be fixed in a way that made more sense. Consider there are more then enough laws forbidding Service Animals all all kinds including DOGS! The DOJ did what it did without much though or brains involved. Not matter what you say SOME unusual Animals are sometimes BETTER then the Normal for reasons nobody takes time out to examine. Just you CANNOT figure something out makes it wrong? People who ask questions and seek info may learn that the world alot bigger then we know and those NON K9s may be more use to use then we know. Hello My name is Cris, and I’m disabled, I suffer from chronic pain and restricted mobility. I have four ducks that make me very happy, and they make me get up every day to take care of them, I have told my Dr. that if it wasn’t for them I would be in bed all day, the pain is too much. I have raised ducks for 5 years back in New England. I have moved to CA two years ago. I donate time at a wildlife rescue where recently acquired A black female Runner duck. I have a mental disability Chronic depression and PTSD with chronic pain. She gives me reason to get out of bed every day. She gives me purpose, makes me feel good. I could put a diaper harness on here and she could be with me every where and help me while in public. I saw a report on the news about some one else who has a legal service duck. I am trying to sort this out. ESAs are not required to have any kind of specialized training or experience. Moreover, Emotional Support Animal Letters isn’t limited to just companion dogs. People have used emotional support cats, horses as Emotional Support Animals.